Lately it seems like almost all of my patients have been asking for snack ideas. In general, I have a few guidelines regarding snacks. First would be timing. Is the snack in question something that you just need to help you bridge a short gap between breakfast and lunch? Or is it something that will need to hold you over for several hours? Perhaps it is heading into “mini meal” territory, for those days when a sit down meal just isn’t going to cut it. Of course, if it’s just a small snack to keep you from being ravenous for lunch or dinner, I would suggest picking a carbohydrate and then having it with a protein or a fat. What does that look like? An apple (carb) with a piece of cheddar cheese (pro/fat), pretzels (carb) with hummus (pro/fat), or a handful of trail mix made with nuts (pro/fat) and dried fruit (carb) are all great examples. Basically, the combination of carbohydrate and fat/protein is the best way to fuel your body between meals as it gives you some quick energy (carbs) and some energy that will satisfy you and keep your blood sugar levels steady (fats/proteins). If a bigger snack is in order, I would recommend having at least a protein, a carbohydrate AND a fat. That could look like a peanut butter and banana sandwich; a homemade pizza bagel made with ½ a bagel, tomato sauce, some shredded mozzarella and perhaps a few slices of pepperoni; or a bowl of oatmeal with a tablespoon of peanut butter and a sliced banana. The main purpose of the bigger snack is to bridge a larger gap between meals while also making sure you will be hungry for the following meal. Even if a patient knows that she is hungry for a snack, sometimes figuring out what exactly she is hungry for can be a challenge. In this instance, I would suggest going through a quick list of food qualities to help narrow it down. Am I hungry for something hot or cold or room temperature? Do I want something creamy and soft? Crunchy or hard? Am I in the mood for something savory or sweet or perhaps a mix of the two? Do I want something spicy? Salty? Bland? Sour? Am I hungry for something cheesy? Meaty? Chocolate-y? It may feel a little silly to go through a list like this, but sometimes it can just take a minute or two to figure out what will really hit the spot. When we dig deeper, I often find that many of my patients have an “all or nothing” mindset about their eating. Either they are 100% committed to making healthy eating choices or they throw their hands up and say “screw it!” It might look something like this: a patient who has stated a goal that she only wants to eat out at restaurants twice per week found herself overworked and stressed and ended up eating out five times during that week. Or perhaps someone has set a goal of meal planning and grocery shopping every Sunday, but he just never gets around to it. A lot of the time, these patients will come in to our appointment with their heads held low and feeling like failures. This isn’t the case! I look at these “failures” as data that we can use to help us in the future. Maybe the goals that were set were too much for that person at the time. Or perhaps there is another area of change that we should focus on. The best thing we can do in our session is to rework the goals that aren’t being met. Sometimes that means making these goals a bit more achievable (e.g. aiming for eating out 4 or fewer times per week for someone who is used to eating out 5 or more times per week). The other idea I think is important is the “good enough,” concept. No one is perfect and similarly, when we expect ourselves to never fail, we are setting ourselves up for failure. Sometimes achieving parts of our goals is better than totally giving up completely. For instance, let’s say someone is really struggling with eating healthy lunches during the week. She is buried under paperwork and totally overextended at work and has been just grabbing a bag of chips from the vending machine. Ideally, she’d like to be packing her home-cooked lunches the night before and bringing them with her to work every day. But, it just isn’t happening. How about working on a middle ground solution? That could be bringing frozen meals for lunch instead of either buying potato chips or bringing home-cooked lunches. Are frozen meals ideal? No. But are they “good enough,” i.e. better than nothing? Absolutely! 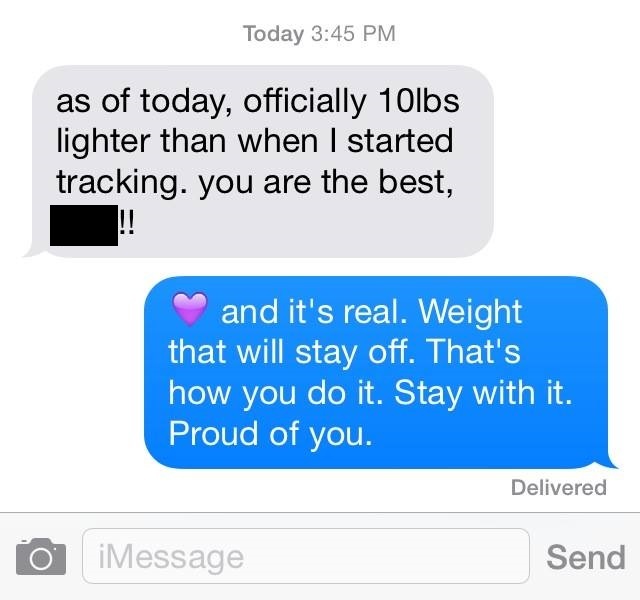 The above text exchange appeared in my Facebook feed, placed there by a personal trainer (whose name I blacked out from the image) who shared it to promote his business, a testimony to his prowess and the results he can bring to his clients who are seeking to lose weight. Let’s talk about results. Losing weight is relatively easy and numerous paths to weight loss exist. Keeping off the lost weight, well, that is a completely different story. Research shows us that about 95% of people who try to lose weight will ultimately regain it (whether or not they maintain the behaviors that created the weight loss in the first place) and of that 95%, 60% of them will end up heavier than they were at baseline. Said differently, if 100 people intentionally lose weight, five of them will keep it off, 38 of them will return to baseline, and 57 of them will end up heavier than when they started. These facts may not be talked about very much in our weight-loss-obsessed society, but they are no secret. At the 2013 Cardiometabolic Health Congress, data were presented showing that this pattern of weight loss and subsequent regain was virtually identical regardless of the mode somebody used to lose it. That is why some people in the healthcare field say that the best way to gain weight is to go on a diet. So when the trainer refers to his client’s 10 pounds of lost weight as “Weight that will stay off,” on what is he basing that claim? Based on the research, if he says something like that to 20 of his clients, 19 times he will be wrong. Not only is he misleading people with false promises and expectations, but he is putting them at high risk for weight cycling and the negative consequences with which it is associated. Chances are better than not that the client in question will eventually regain the 10 pounds he or she lost plus more. What will the text exchange between the trainer and client look like then? The sad thing is that I think the trainer in question is actually a good trainer in terms of the mechanics of his profession. He just needs to be more careful about the lessons he is teaching his clients. Had he responded to his client’s text with a sentiment along the lines of, “Losing weight feels important to you right now, but let’s remember that being physically active is doing wonders for your health and well-being regardless of what happens with your weight,” I would not be writing this blog. To be fair, Grey’s Anatomy is probably not the worst show on television, but the overly-dramatized plots and scenes that are supposed to make me laugh but do nothing of the sort leave me wondering what so many other people see in the show. Its long run of prime-time success seems to indicate that my opinion is that of the minority. Above my other criticisms, the aspect of the show that rubs me the wrong way is how themes in patient care just so happen to mimic whatever events are going on in the doctors’ personal lives. Every episode this occurs. My eyes roll. As if someone is telling me the same joke over and over again, I want to interrupt and plead: Stop, please, I get it already. Then to my horror, I realize the joke is on me: They’re right. The themes running through patient care and my own life really do seem to happen with such regularity. In the midst of a late-summer walk, the inspiration hit me to try jogging for the first time since my surgery. I broke out into a jog and slowly shuffled along before the pain in my back was so intense that I had to slow down and resume my walking. Maybe I had jogged 20 yards, roughly the equivalent of crossing a wide street. This occurred in early August. According to surgeons’ predictions, I should have been able to start running in June. In both life and healthcare, only some factors are in our control. The rest of them? Who knows. That is why I am so careful about tying goals to specific outcomes that are only somewhat under our influence. Furthermore, it is why I am wary of predicting how my patients will fare in terms of weight, cholesterol, blood pressure, or whatever other outcomes they are attempting to influence. One of the most influential lessons in my life happened in the span of a few seconds in the south Pacific. As I sat on the boat’s edge preparing to snorkel at the Great Barrier Reef, a wave came up and dragged me into the water. There is power, and then there is power. Mine was dwarfed by that of the ocean, which had its way with me. While I struggled to get back to the boat as the water pushed and pulled me with much greater force than I anticipated, I had an epiphany of humility: We do not have as much control over our lives as we would like to think. Having only limited control does not mean we should throw up our hands and give up. It just means we need to keep perspective, accept our limited power as we continue our work, temper expectations, and adjust to whatever comes. After five months of waiting, I was finally cleared to begin physical therapy in late August. With the help of my therapist, I am working hard to reclaim my conditioning and put myself in the best possible position for my desired outcome: a return to competitive running and tennis. Neither sport is a possibility right now, even though I had expected to be able to resume both activities months ago. Given that, I have refocused my efforts on outdoor cycling. Getting on my bike again was fantastic. Riding produces no pain whatsoever. Although my cardiovascular fitness has plummeted due inactivity and I am not able to ride as far now as I used to, just going through the routine of prepping my bike, putting on my helmet, starting my bike computer, and setting off down the road is the closest to the old me I have felt in just about a year. It makes me feel, well, normal. We only have so much control over what happens and when, but if we keep our expectations in check and adapt accordingly, we can still find ways to thrive. I’m sure there must be a Grey’s Anatomy episode about that. The title of Nutritionist is unregulated. Anybody can call themselves a Nutritionist. You are a Nutritionist. Your neighbor is a Nutritionist. So is your infant. And your dog. The title is meaningless and does not indicate that the person has any training or expertise whatsoever in nutrition. In contrast, the title of Dietitian (short for Registered Dietitian, RD) coveys that we completed a program of formal academic study in nutrition, graduated from an accredited internship program that included working in a wide range of specialties within the field (everything from food service to organ transplant), passed our boards, partake regularly in continuing education, are registered with the Commission on Dietetic Registration, and have a license to practice in the state. Dietitians are held to a code of ethics, just as doctors, nurses, and other licensed health care practitioners are, and we are recognized within the medical community as the experts in nutrition. 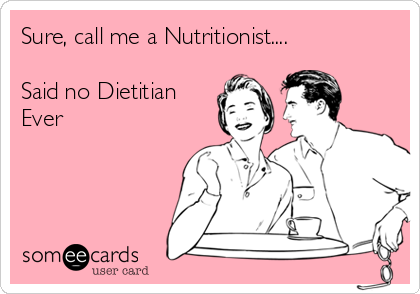 Despite the meme posted at the top, some Dietitians do refer to themselves as Nutritionists. Doing so is nothing more than a public relations strategy. While Nutritionist is a hollow title that means nothing, its inclusion of the word “nutrition” yields a title to which laymen can relate. Furthermore, some people mistakenly believe that Dietitians only work inpatient jobs at hospitals. These misunderstandings are so common that the Commission on Dietetic Registration now gives the option for a Dietitian to call him or herself by the alternate title, Registered Dietitian Nutritionist (RDN). So, all Dietitians are Nutritionists, but not all Nutritionists are Dietitians. If you are looking for help with your eating, check the person’s credentials first and make sure he or she is a Dietitian. Is the Risk of Foodborne Illness Worth It? Almost immediately after posting a Wall Street Journal article entitled “Does Rinsing Fruit Make a Difference?” on our Facebook page yesterday, I got an email from a family member talking about pre-washed salad mixes in the past tense (“What a convenience they were.”) and asking me if I will change my own eating habits because of this article. When it comes to foodborne illness, risk always exists. One can take every known precaution and still contract a foodborne illness, or one can grotesquely forgo all food safety guidelines yet not get sick. The question is not one of risk’s presence, but rather one of risk’s relative magnitude. Each one of us has to decide for ourselves how much risk we are comfortable taking. The article talks about the health of one’s immune system as being an element of consideration, but other factors are in play, too: What does one like to eat? What can one afford? How much time does one have for food preparation? What are the realistic alternatives if one forgoes a given food? Pros and cons exist for eating and not eating a given food, and these must all be considered before reaching a conclusion. The answer to my family member’s question is no, I will not be changing my own eating based on this article. Generally speaking, I do not care for vegetables. I know, I know, a dietitian who does not like vegetables. As it turns out, dietitians are people too and we have our own challenges with food just like everybody else. The modes in which I enjoy vegetables are slim: carrots and peppers dipped in humus, spinach in lasagna, and broccoli and mushrooms on pizza. In terms of true enjoyment, that’s about it. Raw salad greens topped with fresh fruit and nuts are moderately enjoyable, but the tipping point is such that convenience is a major factor for me. Take away pre-washed salad mixes and the likelihood that I will buy whole greens and prepare a similar mixture on my own is very slim. Therefore, when I weigh their benefits against the risk of foodborne illness, continuing to consume pre-washed salad mixes makes sense for me. Somebody else might reach a different conclusion for his or her own life and that is perfectly fine. My case is nothing more than an example; I am not suggesting that others should or should not reach the same conclusion for themselves that I have reached for myself. Everybody has different needs, priorities, goals, and constraints, which is why Joanne and I feel so strongly about providing individualized nutrition counseling that is customized for each one of our patients. I spent the last four days at the Cardiometabolic Health Congress, where international experts in cardiovascular and metabolic health gathered to discuss the latest developments in our field. One of the talks that I think will be of most interest to you, our readers, addressed the question: Which diet is the best for losing weight? The presenter discussed a study that compared the weight loss of subjects put on over 20 different popular diets. As it turned out, there was no significant difference in weight loss between any of the diets. The pattern was the same for each: sharp initial weight loss, followed by steady weight regain. In other words, the study supports what other research has shown too, namely that dieting does not work in the long run. Furthermore, it does not matter which diet one chooses, as each diet is just as good at ultimately failing as any of the others. The presenter shared another study that looked not at weight, but at actual markers of health (i.e. cholesterol, blood pressure, blood sugar, etc.) and found that the dietary approach that a person takes absolutely matters in regards to these markers. So, what is that dietary approach that makes such a difference for health? An individualized approach. There is no one eating pattern that will work for everybody; it has to be tailored to the person in question. The presenter stressed the importance of taking into account the specific person’s preferences, risk factors, current habits, and goals. In other words, to really make a difference in terms of somebody’s health, he or she does not need another diet, but rather individualized nutrition counseling. 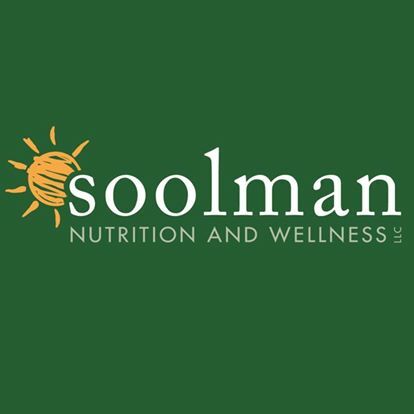 We at Soolman Nutrition and Wellness LLC already knew that, which is why you see the term “Individualized Nutrition Counseling” on our website, business cards, brochures, and advertisements. I will say though that it was nice to receive confirmation that the approach we take with our patients is supported by the most current research. If somebody you know is sick of diets failing and he or she is ready to get healthy, send him or her our way and we will be happy to help.